In a case of medical negligence at Nizam's Institute of Medical Sciences (NIMS), Hyderabad, doctors left behind an artery forceps in a woman's abdomen. 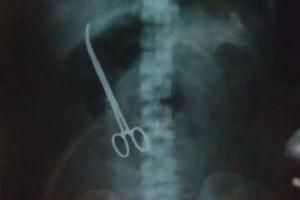 The forceps were left three months behind during surgery. The incident only came to light on Saturday, when an X-ray report revealed that a pair of forceps was embedded in the abdomen of the 33-year-old patient. The woman's family member immediately lodged a complaint with the police and staged a protest outside the hospital. The woman has been admitted for another surgery. An inquiry has also been ordered. 'நம்ம கிரிக்கெட்டோட மூளையே 'தல' தான்'...அவர் கண்டிப்பா உலககோப்பைக்கு வேணும்...நெகிழ்ந்த வீரர்!